It’s been a few months since MoDOT announced that it has been forced to layoff and curtail a large portion of its operations. Whereas in recent years MoDOT had been living large spending $900 million to $1.2 billion a year, MoDOT’s budget for the foreseeable future is only about $600 million a year. How did this happen? An article in the St. Louis Post-Dispatch had a very good summary explaining that MoDOT’s funding woes are largely of its own doing. Back in 2004, MoDOT’s “concrete lobby” helped persuade voters to take what now is about $150 million a year out of general revenue and put it in the road fund. That’s one reason that money has been tight for other programs. MoDOT used the money to float a construction bond issue. The work is mostly complete, so now it’s time to service the debt. In addition, MoDOT used anticipated federal revenue to float special bonds for a portion of the half-billion dollar reconstruction of 10 miles of Interstate 64/U.S. Highway 40 in St. Louis. So, to the extent that MoDOT is now falling off a cliff, it’s a cliff that it happily climbed. As recently as a decade ago, Missouri roads were widely credited as being among the nation’s worst. The “concrete lobby” then helped pass Amendment 3 which stopped the state from claiming half of the revenue collected from the sale of motor vehicles for the general fund and mandated its use on highway and bridge projects. MoDOT put its new guaranteed revenue stream to work and then some, issuing bonds to fund its Smoother, Safer, Sooner initiative. The rapid pace of the initiative had an almost immediate effect with the overall public perception of Missouri roads drastically improved. The only problem, MoDOT didn’t know how to quit when it came to bond money and the bill has finally come due. Apparently, public officials have difficulty ignoring the glory that comes from building new roads and highways. However, a financial crisis was inevitable for MoDOT even if the agency had shown more fiscal restraint in the years following the passage of Amendment 3. 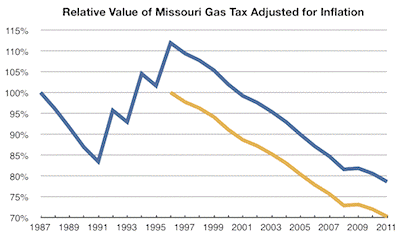 The reason: the declining value of Missouri’s gas tax. The state gas tax is 17¢ per gallon and is currently amongst the lowest in the nation. The gas tax is not indexed to inflation and has not been raised since 1996 when the last of a trio of 2¢ increases took effect. As a result, the inflation-adjusted value of the gas tax has been steadily declining by about 3% every year and has lost 30% of its value since 1996. Considering that Amendment 3 was a diversion of existing revenue, the last real effort to increase funding for state transportation was in 2002. Then, a proposition was made to increase the gas tax by 4 cents and the state sales tax by a half cent. It was soundly defeated by voters by nearly a 3 to 1 margin. If another attempt were to be made today to increase the gas tax to fund state transportation projects, it would have to be much more ambitious than the 4¢ proposal in 2002. It would take a 7.3¢ rise in the state gas tax to match the inflation-adjusted level reached in 1996. Of course, that ignores all of the new highways and bridges MoDOT has built in the last 15 years, the rapidly increasing fuel economy of vehicles on the road, and the decreasing number of miles driven by Americans. To reestablish funding sustainability for Missouri’s transportation network, the state gas tax will need to rise by a minimum of 15 cents, a rise currently being explored by the state of Maryland. At the bare minimum, Missouri should peg its gas tax to the rate of inflation to stop its decline in real value.